Will a very thick layer of cellulose in your attic cause your drywall ceiling to sag? Probably not. These recommendations are summarized in the table below. Readers will note that is table has columns for two types of cellulose: hammer-mill cellulose that settles to a density of 2.3 lbs/ft³, and fiberized cellulose that settles to a density of 1.5 lbs/ft³. The higher density cellulose was sold in the 1960s, ’70s, and ’80s. Newer types of cellulose developed in the early 1990s (so-called fiberized cellulose) have an installed density (in attic installations) of 1.5 lbs/ft³ (shown in the last column of the table). Should these recommendations be followed? 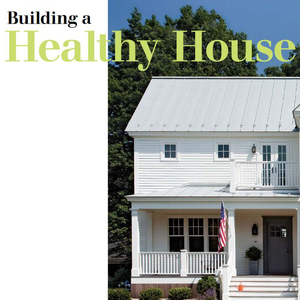 Many green builders ignore these recommendations from U.S.G., and routinely exceed the recommended weight limits. I could not get my insulation sub contractor to install beyond R38 unless I signed off that they were not liable if my ceiling drywall collapse, even if I signed they would not install over R49. He claimed he had a ceiling drywall fall to the floor from the weight of the insulation they were in the process of installing. My guess is the thicker the insulation the more difficult it is to find the framing it stand on someone stepped on the drywall. If you think about it from the contractor’s point of view why take the risk of going beyond USG’s recommendations if anything go wrong it is all on them. Your point -- "The case could be made that installing more insulation than USG’s chart is a code violation as you are not following the manufacturer's instructions" -- is an excellent one. There are lots of hurdles to improving the energy performance of our buildings, aren't there? My point is I can see both sides of this question. The drywall manufactures have no economic incentive to change their reconditions as the change is unlikely to increase product sales any change adds risk however slightly. Take on risk for no benefit is the definition of a bad business decision. Also I want people to see this question as a technical issue while they are planning stages and be prepared to deal with the type of push back I encountered. 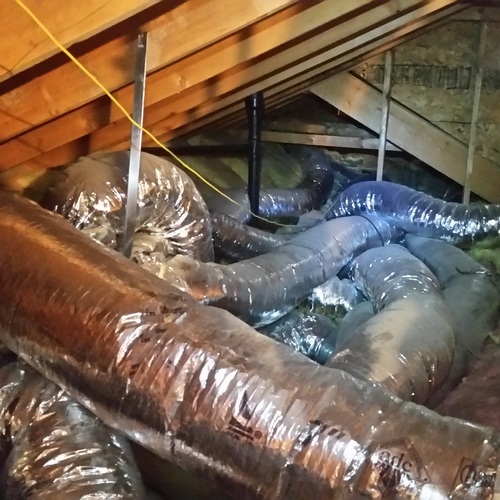 When I was planning I did not foresee attic insulation depth as a technical problem. I was thinking of it as solely a cost/ benefit decision when the technical push back came I was not prepared and I folded. From a return on investment point of view R61 is the place I wanted to get to. With some forethought I may have chosen a different insulation sub or been willing to sign off on ceiling liability. A waiver by the insulator seems quite reasonable. They aren't responsible for the structural integrity of the materials they work around. Tile installers do the same if they aren't comfortable with the span or depth of the subfloor. The building industry quite reasonably works on assumptions about common practices. If we are going to deviate from them, the onus is on us to make sure all the conditions for success are there. That first picture sure looks like a "less than picture-perfect" installation, with lots of dunes & dips. Most pros would rake it out flat, and have multiple paper depth gauges to refer to. Or perhaps that's a work in progress- there appears to be depth markings on the king pins of the trusses varying from 2" to 12" above the existing cellulose levels in that attic. 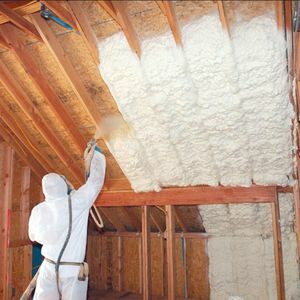 water vapor absorption a problem or an advantage of cellulose? The lack of documented failures seems to indicate that water vapor absorption by cellulose isn't a problem. 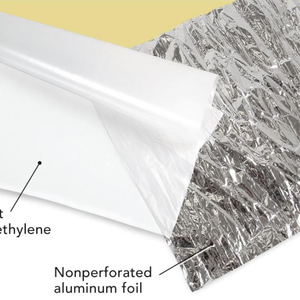 An air or vapor barrier sheet product might add to the structural support for insulation above, in addition to strapping. A problem might occur when a roof leak or wind-driven rain puts water into the attic and the cellulose gets heavier from water absorption. Plus water can damage the drywall and reduces its structural strength to resist the heavier cellulose. 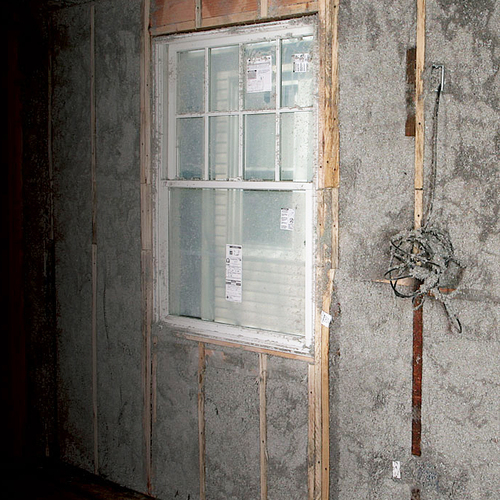 Any common type of loose fill insulation wouldn't stop drywall from getting damaged, but cellulose might be worse than lighter non-hygroscopic insulation (e.g., fiberglass)? Or cellulose might be better in cases with minimal water intrusion, since it would absorb moisture rather than pass the moisture to the drywall below? Or maybe be more likely to wick moisture to air above to dry out faster?? Just curious...how much water vapor could be absorbed by cellulose, and how heavy could the cellulose become with a higher percent of water content? Assume this would be more likely in summertime with more content moisture in the air, when air is reaching its dew point? Even damp-sprayed cellulose is only ~40% moisture content by weight when applied, and drops back to ~10-15% m.c. within a couple of months. Even under extreme air conditioning with 68F ceiling gypsum in a 65F room temperature when outdoor dew points are in the mid-70s the moisture content won't go over 15%. They typical density numbers for dense packed walls assume ~10% m.c., but the actual density will vary a bit by season as water comes and goes. 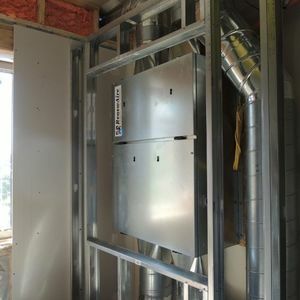 Moisture saturation of the cellulose is more likely in wall assemblies in cold climates, where the cool side of the cellulose dwells WELL below the dew point of the conditioned space air for weeks and months at a time. 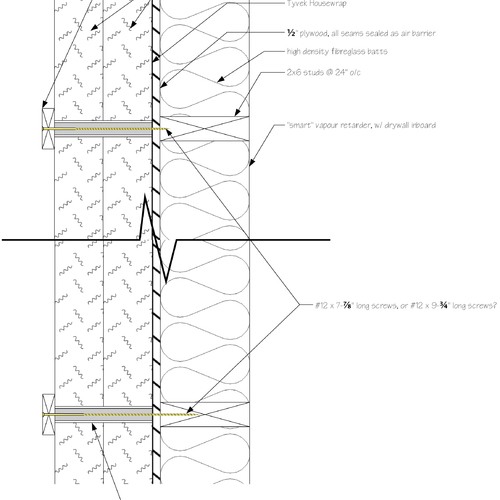 Air leaks to the interior, and low vapor retardency on the exterior limiting the dry-through rates can theoretically get you there in a zone 6 or higher climate, but most instances of wet cellulose are due to bulk water leaks. 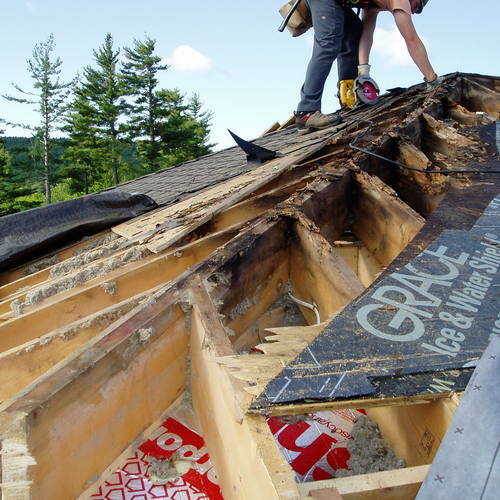 Small roof leaks can sometimes be masked by deep cellulose fill for quite awhile before the capacity of the cellulose is exceeded and it begins to seep through the ceiling gypsum. I agree with Dana's analysis. 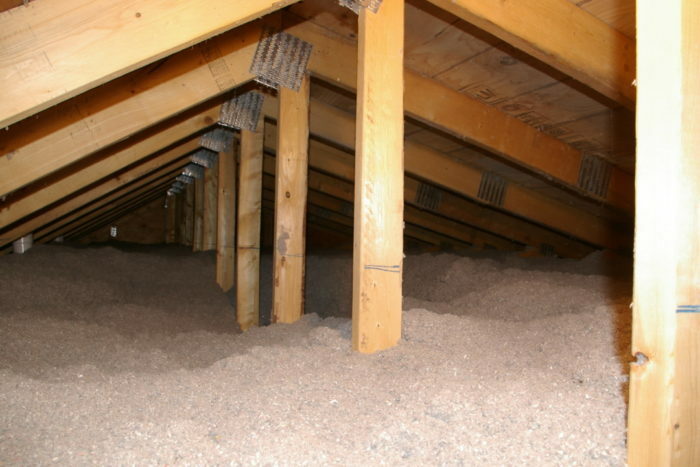 You wrote, "A problem might occur when a roof leak or wind-driven rain puts water into the attic and the cellulose gets heavier from water absorption." That's true -- but any ceiling can fail when faced with a roof leak, regardless of the type of insulation installed or the thickness of the insulation. For those that want to steer clear of this issue in an abundance of caution (or who have contractors who demand it), can some sort of decking be applied to the top of ceiling joists to support the load? I can understand why subfloor or similar material would be undesirable from a moisture perspective, but what about a series of 1X4 strips with, say, 2" gaps between each pair? This would make a "breathable" support surface, with the side benefit of allowing future occupants to walk around in deep cellulose without fear of punching a foot through the drywall. Is there any reason why this can't or shouldn't be done? The space between the ceiling joists usually contains insulation, so your suggested 1x4s would divide the insulation depth into two sections -- below the subfloor and above the subfloor. There might be differential settling and air gaps with your method. That's why I prefer the method suggested in my article (for worry-warts) -- "to install 1x3 or 1x4 strapping, 16 inches on center, on the underside of your ceiling joists before installing the drywall."